Dal fry recipe – boiled split pigeon peas are cooked with onion-tomato and spices. This is restaurant style dal fry recipe. Toor dal or arhar dal is used to make this dal fry. But you can also make using other dal e.g. Moong dal, chana dal or you can make using mix of dal like this home style dal fry recipe. It is very easy and simple to make. If you follow the recipe and use proportion of ingredients exactly as mentioned, I bet it will taste exactly same as restaurant one. For making this punjabi dal fry, onion-tomato is cooked with some spices. Then boiled toor dal is added. Then it is simmered for few minutes so all the flavors will get mingle. Finally drizzle some lemon juice and sprinkle coriander leaves. Dal fry is ready to serve. Whenever we go to the North Indian restaurants we end up our dinner with dal fry – jeera rice or dal tadka – jeera rice. 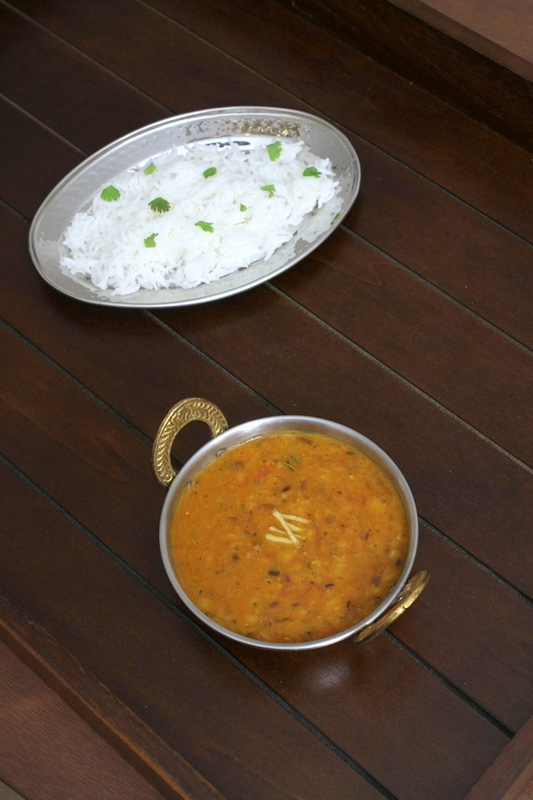 Dal fry and dal tadka are the two popular dal dishes that served in Punjabi restaurants. We order dal makhani very rarely because hubby likes this homemade one. Dear husband never gets satisfied by taste of dal fry in Indian restaurants in USA except few restaurants. Most of the restaurants here have “Americanized” taste in Indian food. It usually have mild flavors which we do not like at all. We like spicy (not that spicy but definitely not mild) and rich food when it comes to restaurant food. After disappointment in many restaurants’ food taste, I usually try to make popular restaurant recipes at home. For that I have referred many cookbooks and come up with this recipe. It is exact restaurant style dal fry that we get in India. Even though I made it restaurant style, I have not used whole lot of oil like outside food. 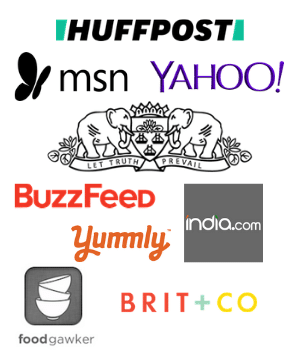 So it healthy and you can make it on everyday basis too. 1) Wash arhar dal under running cold water till water runs clear. 2) Take washed dal and 1 cup of water in pressure cooker. Cover with lid, put the weight on. Turn the heat on medium. Let it cook for 5-6 whistles or till dal becomes soft. Let the pressure go down by itself then open the lid. Keep it aside. 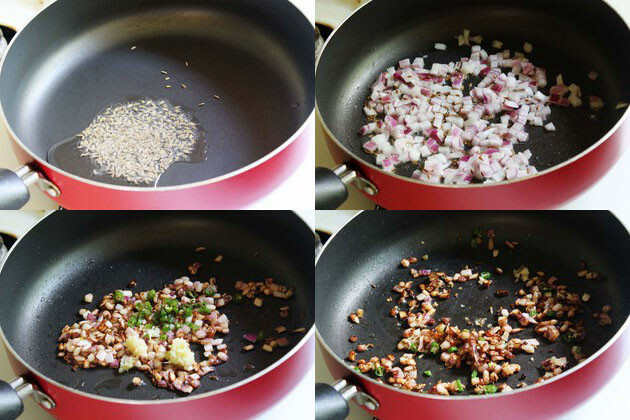 3) Heat the oil in a pan on medium heat. Once hot add cumin seeds. Let the sizzle a bit. 4) Then add chopped onions. Cook till onions are soft and light pink in color. 5) Then add ginger paste, garlic paste and chopped green chili. 6) Saute for a minute or till the raw smell of ginger garlic goes away. 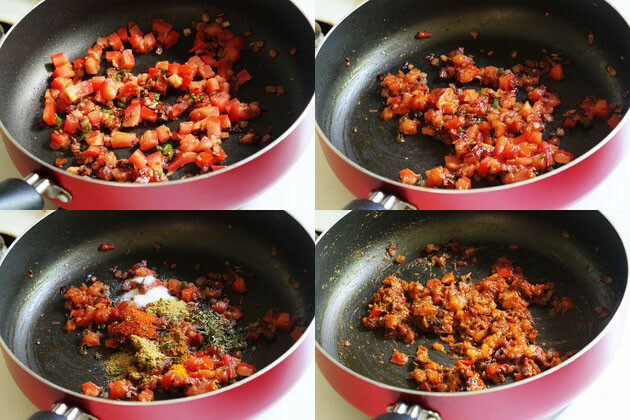 7) Then add chopped tomatoes and mix. 8) Cook till tomatoes are soft. 9) Then add red chili powder, coriander powder, cumin powder, turmeric powder, garam masala and kasoori methi. 11) Then add cooked dal and 1 cup of water. 12) Mix well and bring it to a boil. Then let it simmer for 5 minutes. 13) Then turn off the stove. Add chopped cilantro. Also squeeze some lemon juice. 14) Mix well. Remove it to a serving bowl. If not serving right away then keep it covered. So it stays warm till the time of serving. Make this dal fry in your kitchen and let me know how you like it. UPDATE: Recently I tried to do the dhungar at the end similar to my dal makhani recipe. The taste was beyond my expectation. Just wow. Do give it a try, I am sure you will like this smokey flavor in this dal fry recipe. 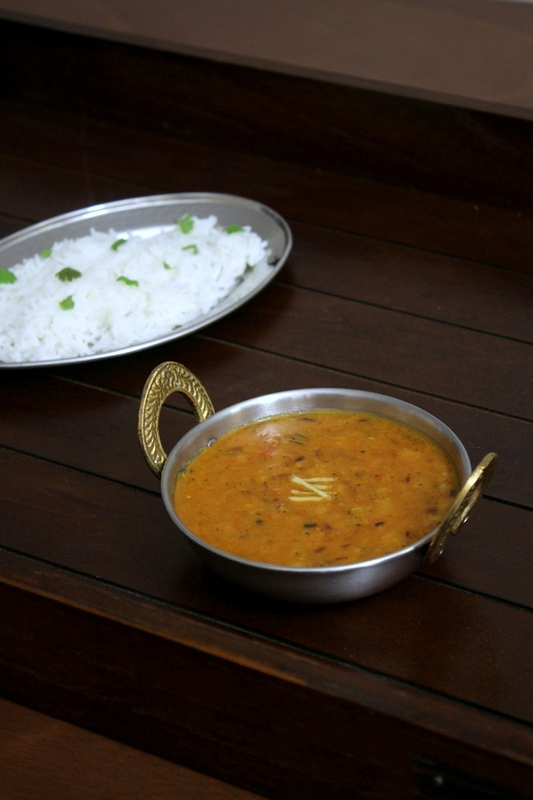 Serving suggestion: Serve dal fry with plain rice or jeera rice . It can be served with any mild pulao like vegetable pulao, mushroom pulao, green peas pulao, corn pulao or capsicum pulao. You can served it as a side with paratha as well. Wash arhar dal under running cold water till water runs clear. Take washed dal and 1 cup of water in pressure cooker. Cover with lid, put the weight on. Turn the heat on medium. Let it cook for 5-6 whistles or till dal becomes soft. Let the pressure go down by itself then open the lid. Keep it aside. Heat the oil in a pan on medium heat. Once hot add cumin seeds. Let the sizzle a bit. Then add chopped onions. Cook till onions are soft and light pink in color. Then add ginger paste, garlic paste and chopped green chili. Saute for a minute or till the raw smell of ginger garlic goes away. Then add chopped tomatoes and mix. Then add red chili powder, coriander powder, cumin powder, turmeric powder, garam masala and kasoori methi. Then add cooked dal and 1 cup of water. Mix well and bring it to a boil. Then let it simmer for 5 minutes. Then turn off the stove. Add chopped cilantro. Also squeeze some lemon juice. Mix well. Remove it to a serving bowl. I have been experimenting with two other Dal Fry recipes and I’ve never been satisfied with the results. But your Dal Fry blew me away. I just cooked it and had two servings with plain rice and yogurt on the side, and WOW! This meal totally made my day. I never leave comments under recipes but I after this meal I felt the urge to thank you for the experience! 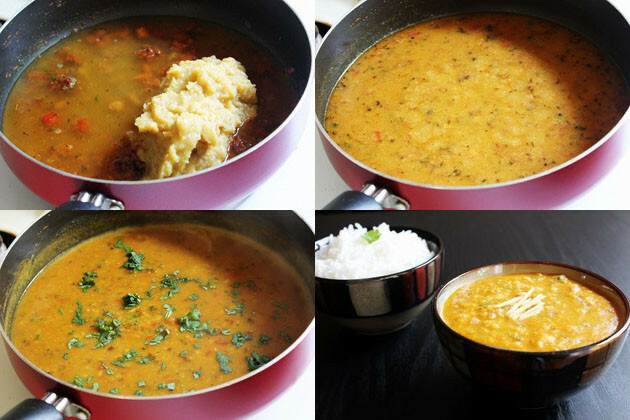 Can’t wait to try other dal recipes from your site! Thank you so much for your positive comment. Glad to hear that you liked it. And hoping you enjoy other recipes as well. Tried this and loved it!? Thanks a ton for the provided recipe. I served it to my neighbor and they were like how could pulses turn so delicious. Made my day.